If you’ve been keeping your eye on YouTube news then you’ll be aware they recently launched YouTube Red. The service will cost US$9.99, but you can get your first month free. Unfortunately like many things it has been released in the US first and if you visit the site from the UK or elsewhere then you’ll be told it isn’t available. Thankfully I have a solution that will allow you to watch Youtube Red outside the US. YouTube Red the new ad-free exclusive content service. So if you’re looking at how to watch YouTube Red in the UK and Europe or in fact anywhere else then keep on reading as I’ll show you the easiest way to get this done. YouTube Red for those of you who aren’t aware is the new service from YouTube that has some excellent features and over the coming months will be well worth signing up to. The service allows you to get rid of those pesky adverts that have been plaguing YouTube videos for the past few years. Other features include the ability to download videos and music to play offline on your mobile and use their new background play service that keeps videos running while you use other apps or have the screen turned off. Apart from those new features one of the biggest benefits is YouTube Red will have exclusive content from some of the biggest Vloggers such as PewDiePie and other famous YouTube celebrities. The new service is available at the YouTube Red web page and if you attempt to access it anywhere outside the US then it’ll tell you that the service is not currently available in your country. YouTube Red is not currently available in United Kingdom. It doesn’t actually matter where your YouTube account is registered as the service simply checks your IP Address. An IP Address is assigned to your internet connection to make it work and because of this YouTube Red can determine your location. So when you visit the YouTube Red website it automatically blocks you. The solution is to get yourself an IP Address from the United States where YouTube Red is accessible. 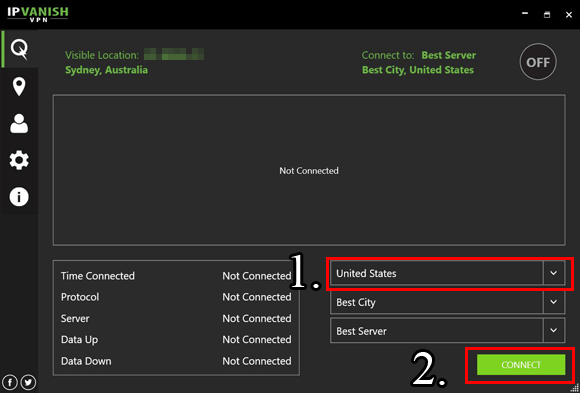 The best, cheapest and easiest method to do this is to sign up for a VPN service. A VPN service allows you to connect securely and encrypted to another location and access the internet via that point. Due to this you can appear as if you’re anywhere in the world and for the purpose of watching YouTube Red you can appear as if you’re in the United States even if you’re in the UK, Europe or anywhere else. VPN services are available from plenty of different companies and with a no log provider like IPVanish can cost as little as US$6.49 (Approx £4.21) per month. To watch video you need a fast and reliable VPN service and through my testing and VPN reviews I’ve come to the conclusion that the following three providers are the best choice to watch YouTube Red. Just click the green button on the right of the provider name to visit their site and sign up. Once you’ve signed up you’ll want to download and install the software or app for your device. All three providers work across major devices so and you can alternate between them. Follow my step-by-step guide below to get accessing YouTube Red. I’ll use IPVanish as an example, but other providers work pretty much the same. Select United States in the bottom right hand corner and press Connect. Once connected visit the YouTube Red website and sign in. If you’ve hadn’t already signed up then you can get a 30 day free trial, just enter your usual address but with a US Zipcode like 90210 and then enter your credit, debit card or PayPal details. Now all you need to do is enjoy advert free YouTube streaming and exclusive content from some of the most well known YouTubers! This was very helpful but i got to the stage where it asks for your card details….. I have an Irish Card and it wont let me use it. What should i do? Does it give you a specific error message? You would need a VPN router for easiest access on a games console. An alternative would be to sign up for a SmartDNS service from a provider like Overplay but I’m not sure any of them support Youtube.